Today my parents came up and we collected three new girls with them to add to the coop! 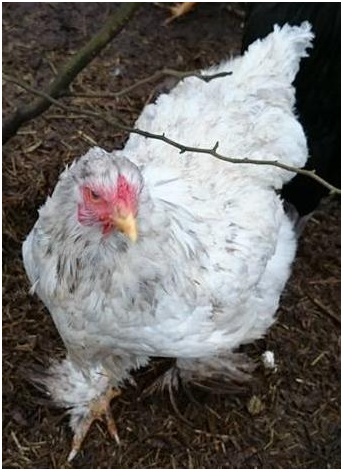 We collected two beautiful big Brahma girls from a chicken rescue centre (the back of someone's house!! 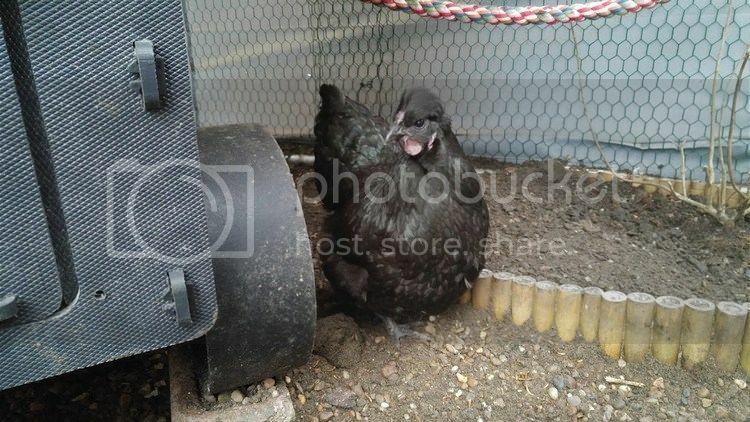 They had a fantastic set-up; lots of land for the chucks and the ducks, several roosters and hens of all sizes) and then we went to collect a PILKIE - a Silkie cross Pekin!! Currently my dad has the three new girls in the wagon with the other four. Tomorrow we think the plan is to remove Renee (as she is most definitely the one that will attack the new members) and leave the new girls in there. Ariel is the only other hen that should possibly pose a threat, but unlike Renee she is easy to catch so if need be she will be removed too. Renee will spend a day or two in an XXL dog crate / whelping pen, where she can see all the girls but not interact with them - hopefully when she does go back in she will be so relieved to be back in the flock, and used to seeing the newbies, she won't be as vicious! Currently we are still choosing names. You have found chicken heaven here at Hencam. I see Neil out with the girls now..LOVE it and so happy you got new girls. I've found watching the way Renee and the new girls interact absolutely fascinating. The camera glitched so I wasn't able to watch the initial interactions (which my dad said were worse) but after Renee was in time-out I actually thought she did really good. She is top dog, has a feisty personality AND she has six chickens below her to prove herself to - three of them are new. The pressure is on her now. For the most part she was able to co-exist with the new girls; there was tension between everyone but they were all going about doing their own thing. The Pekins stuck together, Ariel was often included in the group too, the new Brahmas stuck together, Pilkie was on her own and Renee went between them. Renee would walk around the new girls and watch them closely under the guise of doing her own thing; what was good was that none of the new girls challenged her, they all moved away respectfully. It was rare that it built up to Renee actually pecking them; from a dog training perspective the moment she began focusing too intensely on them I would either throw down a handful of treats (veg or corn - high value but can be fed in quite high amounts, mealworms aren't that good a choice for a scenario like this) or I would leave her and see how it goes...fighting is okay, it's going to happen, and I wouldn't interfere until it was intense. Interrupting and distracting early would prevent the fighting but it needs to happen at some point, it's just about getting the chickens to the point where they are calm enough the fighting won't result in injury or blood. I actually thought the interactions looked really good though, and if someone could spend most the day with them I'd leave Renee in and have handfuls of goodies on hand to throw whenever she was getting wound up - this is the same as a positive interrupter for dogs essentially - my worry with taking her out all the time is that every time she gets put back in she has to re-do all the bossiness she already did, and tensions run high again and everyone gets freaked out. However if nobody can spend the day nearby I'd take her out because once she gets into that zone of 'need to get the newbies!' I think she would end up doing damage. The problem with yelling "No!" or clapping your hands is that usually it doesn't end the chickens who are mid-fight (they are too into it to listen) and all it does is scare the other chickens who are behaving, which isn't fair. So I'd go for a treat throw before any fights break out, or if they were fighting moving towards them and physically breaking it up. The hard thing is knowing which fights to ignore and which to break up, but the few fights I saw on cam didn't look too bad...it was mainly the Brahmas standing up to Renee with them jumping up and showing their feet, nice and easy to break up! However my dad did say Renee latched onto one of the new girls earlier and was rolling on the ground holding onto her, so I must have missed the worst bits. 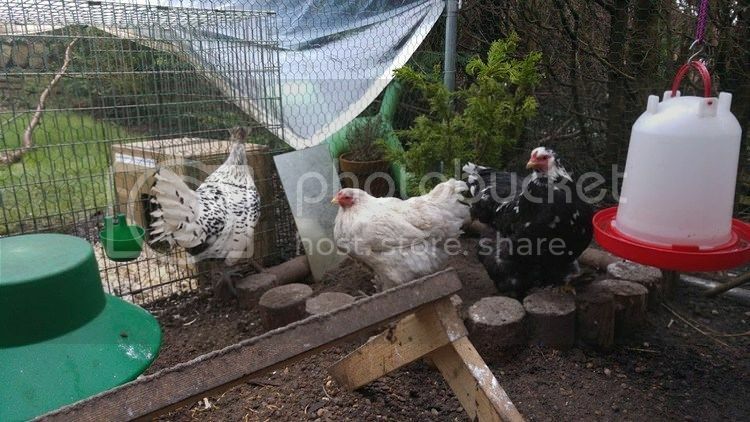 Maude actually pecked the b&w Brahma several times, and the Brahma didn't move away or peck her back - she stood tall, gave Maude a look (which sent her scampering) then resettled herself and carried on with what she was doing. That was really cool to see, and it's awesome to see one of the new girls using the minimal force necessary - she could have chased Maude all over the run then but as it was she didn't even peck her. 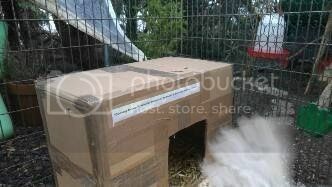 Brahmas are known for being confident, gentle, laid back chickens (they can afford to be, they're massive!) and that was a shining example. The girls (minus Renee) are all calm. 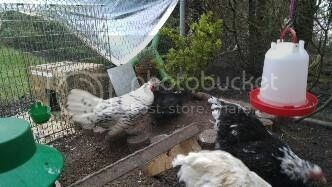 The Pekins & Ariel are on one side, the Brahmas in the middle, and the Pilkie is doing her own thing. Interestingly she is moving as close as possible to Renee - my dad said the Pilkie was feisty too haha!! Pilkie also seems to enjoy all the perches and climbing on the flowers, which would make sense as her enclosure had lots of branches to perch on going quite high. 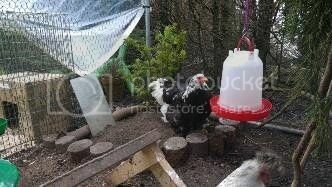 Pilkie drinking out the waterer with Brahmas nearby, everyone is calm, nice body language. Pilkie now gone to stand next to Mabel, who hasn't reacted at all, she is just standing snoozing. Maude and Ariel to Mabel's left, and the Brahmas are calmly wandering about scratting for food. The Brahmas seem very comfortable. Renee can be seen in the background looking utterly miserable, doing the chicken-beak-to-the-mesh movement and just wanting in. Meanwhile in the coop everyone seems calm for now. It's hilarious on cam as you have a gigantic white blob (Brahma) a medium white blob (Ariel) and a tiny white-ish Maude blob!!! B&w Brahma stood right next to Maude, both very much at peace with each other. 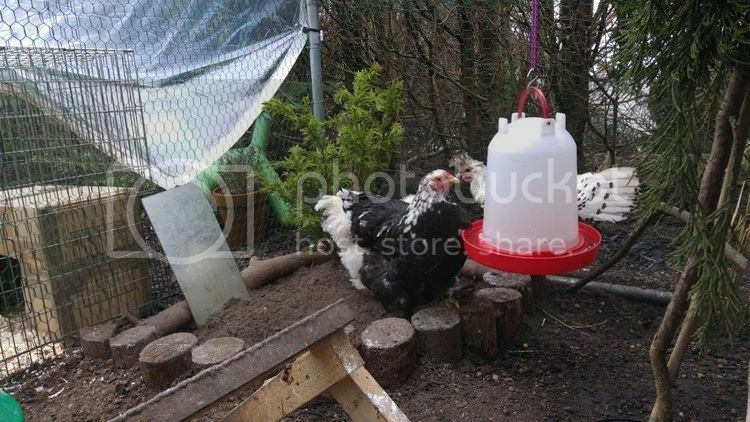 Ariel's behind them and the white Brahma is eating from the feeder. Mabel's to one side and I can't see where the Pilkie is. Oh wait she's appeared from round the back, she's stood just outside the dust bathing area where the others are and is grooming herself. 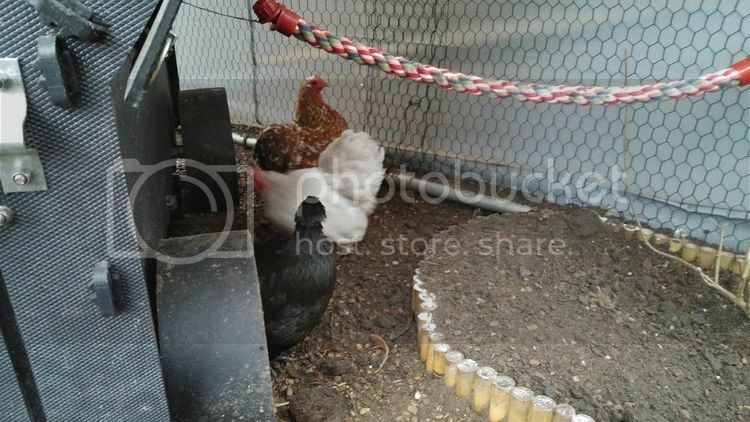 Pilkie has gone into the nest box where there is an egg and is settling herself down; everyone outside is doing their own thing, the white Brahma is lying down next to the food bowl. Pilkie is now checking out the other nest box on the right hahahaha, perhaps she feels an egg brewing and wants to check out the facilities! Stood at the entrance to the wagon now watching the others. White Brahma moving past Maude with no animosity at all, Pilkie has taken herself off round the side close to the rear of the wagon having some time alone - she is such a beautiful bird! Both Brahmas are hoovering up dropped food from the floor near the feeder. Everyone but the Pilkie and Renee are now choosing to be together in a small space, pecking at things and grooming themselves. 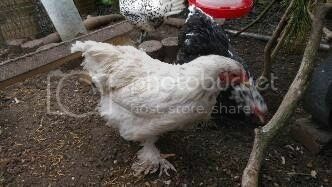 B&W Brahma just did a nice long relaxed wing stretch. Pilkie moving through them with no issues. Everyone moving further apart now, all very much happy to do their own thing. **eta** I know I said I'd stop but this was really interesting to see! Ariel was pecking food off the ground. The b&w Brahma walked up and was pecking nearby, then moved very close and was pecking stuff right from under Ariel's beak - no aggression, just as if she was testing the boundaries. 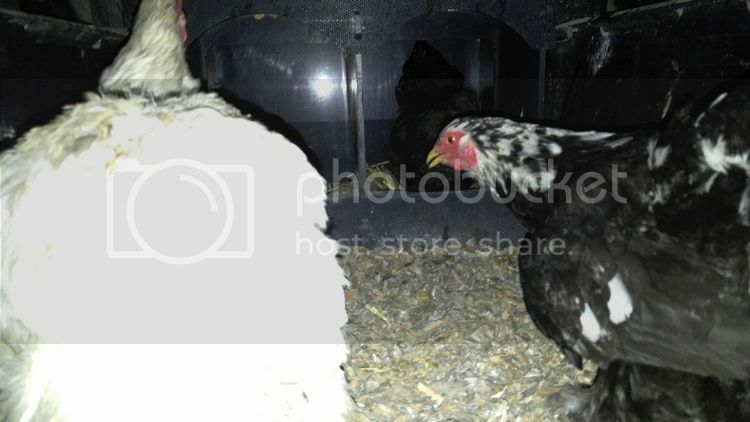 Ariel froze and didn't move a muscle for about ten seconds, then when the b&w Brahma ignored her she resumed eating. Ariel wanted no squabbling at all and was happy for the Brahma to take charge. I wonder what order the pecking order will end up in?! 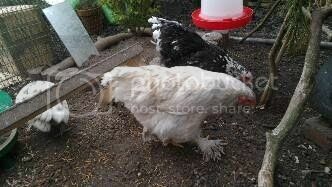 Also if you see the white Brahma close to the cam you will see she is really pretty and not 'just' white. She is kind of lavendery blue with darker and lighter streaks running through. Great posts! 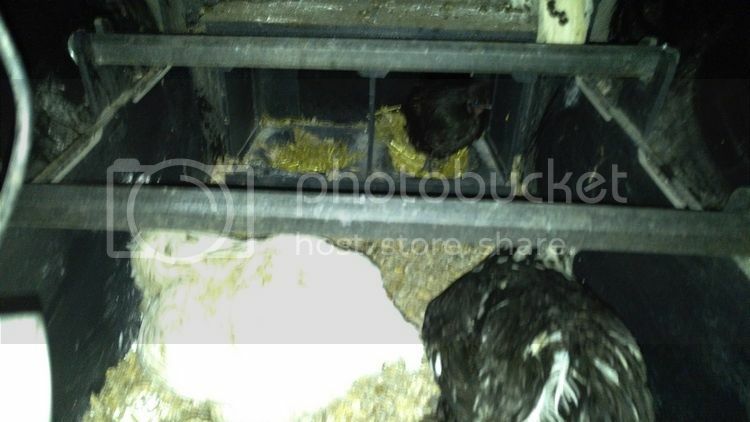 I have no idea how the intricacies of new hens works so it's great to read an 'expert' view! I feel quite sorry for Renee - sounds like all of the others are getting along famously but she's left out. I love them all - they're fabulous, especially Pilkie. 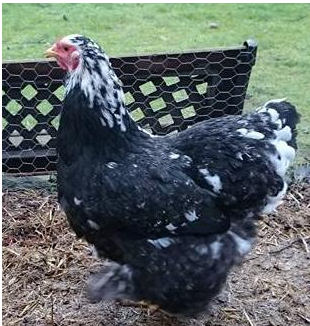 Although I have a bramah bantam of my own so should really stick up for them! I've seen some really interesting interactions today - looks to me that the b&w Brahma is actually top of the pecking order out of the five girls that are in with her currently. I've seen Mabel, Maude and Ariel defer to her, or walk away when she eyeballs them - this is really amazing because I haven't seen her throw her weight around or actually peck / chase anyone once! Also interesting, Ariel deferred to the Pilkie girl too!! Ariel seems to have a very nice calm nature...at the moment I *think* the pecking order goes something like: b&w Brahma, Pilkie, Ariel, the two banties. I have no idea where the white Brahma fits as I haven't seen her interact with anybody, would love to hear anybody else's observations! Look how Silkie-ish she looks! Renee's bed in segregation I think!! After a busy day yesterday helping Helen's mum move into her new home, we got back at about 8pm - everyone was in bed (and bless her, Renee was in her hotel room asleep). I had intended to get up at about 6:30am to see them come out and make sure they were ok - but I dozed until 7:20 as I had some weird illness thing at about 4am - worst headache I've had in long time and sickness/woozy - I took paracetemol and ibuprofen together and it seemed to do the trick after an hour or so of feeling like death! But anyway, I went out to the girls and Renee and Mrs Pilkington were sat together on the perch, like they'd been friends all along! Renee was a lot chiller around them - she kept an eye on what the girls were doing but I didn't see her pecking or hounding them like she did yesterday - which is amazing! The only peck I saw was a Brahma pecking poor Mabel when she got a bit too close, but she didn't chase her (and I'm not sure the peck even landed, it was more a warning). 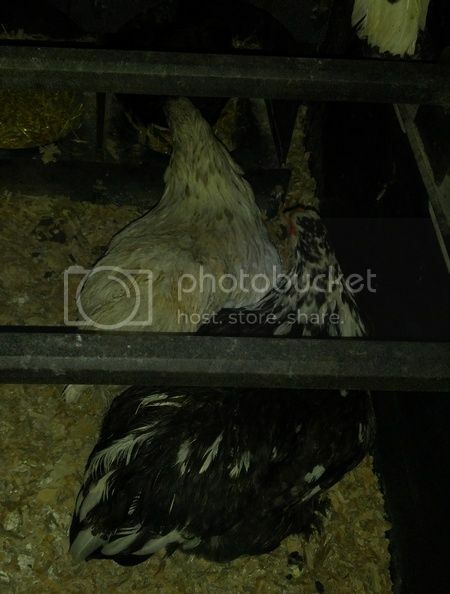 There's an egg in the nest box which I *think* might be the b&w brahma's - not sure - it's quite long and pointy and doesn't look like one of Ariels! Oh, we ran out of sand too which is why the run looks a bit pebbley in places - Helen dug it all out and gave it a really good clean, then she put 4 bags of pea gravel in but didn't have enough sand to cover it all - hopefully get this sorted by next weekend. So, fingers crossed, introductions are done - that was pretty painless really! So glad they're all together and doing well, how easy has this been?! Do you remember the nightmare of ever intro'ing new chickens to Tilly and Penny, and later Milly, Tilly and Penny? !